In 2013, 22.7 million individuals were locked in a pattern of substance abuse in the United States. Despite the perception that certain drugs are “party” drugs, the lives of addicted individuals are anything but celebratory. People living with addiction experience losses in many, if not all, areas of their lives: Their physical health wanes, their mental prowess dulls, their finances wither, and their family ties weaken. This decline is only worsened by increased run-ins with law enforcement and the judicial system. Fortunately, in America, about 2.5 million people do get help – and for them, the benefits of recovery are many and varied. We surveyed 1,039 people going through recovery from drug or alcohol addiction.This is their story, from sickness to health, from hopelessness to hopefulness. To understand the journey to recovery, we wanted to first grasp the average length our survey respondents suffered from addiction. 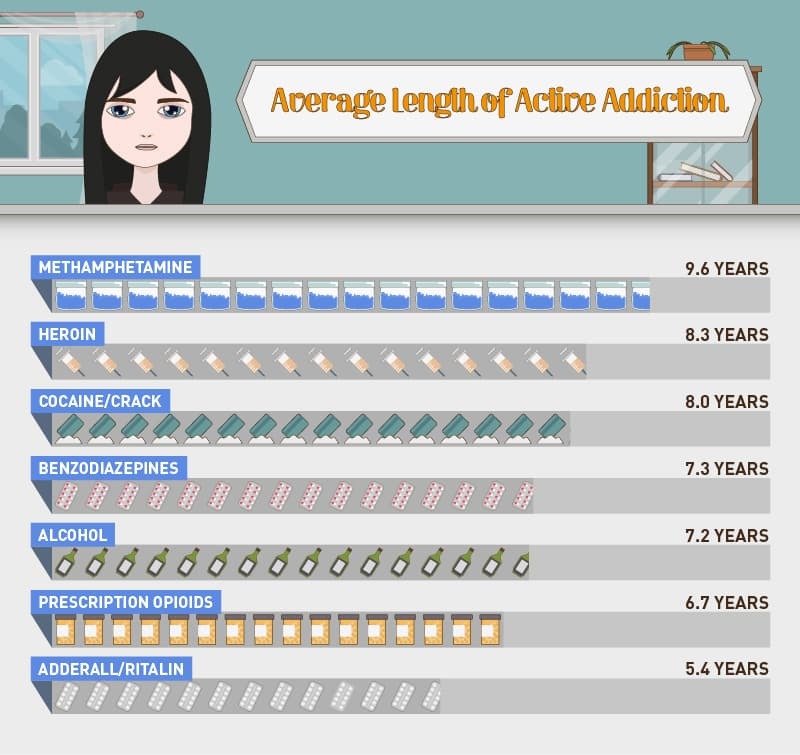 Respondents with methamphetamine, heroin, and cocaine/crack addictions reported the longest average time in active addiction. While people addicted to methamphetamines reported 9.6 years of addiction, heroin users suffered on average of 8.3 years, followed by eight years for cocaine/crack. Why did our survey respondents with meth addictions suffer with addiction for so much longer than our other respondents? According to data at the National Highway Traffic and Safety Administration, several factors come together to make meth a powerfully addictive drug. Research shows that the purity of methamphetamines “is currently very high at 60-90%” and full drug effects can last up to 12 hours after ingestion. While harmful substances may allow users feel better in the short term, our data demonstrates that a life free of substance abuse offers long-term health benefits. “I was homeless for a period of time,” reports a 42-year-old man. “One of the most depressing events I have gone through,” he said. Similar boosts in physical health were reported among those in recovery. Over 79 percent of survey participants in recovery reported their bodies were feeling “good,” “very good,” or “excellent.” In contrast, only about 30 percent of those in active addiction could say the same. In contrast, those recovering from addiction were able to refocus their valuable time and resources on things that mattered such as relationships, finance, and vocation. Ninety-five percent of respondents in recovery reported positive financial experiences, such as paying bills on time and having their own place to live. 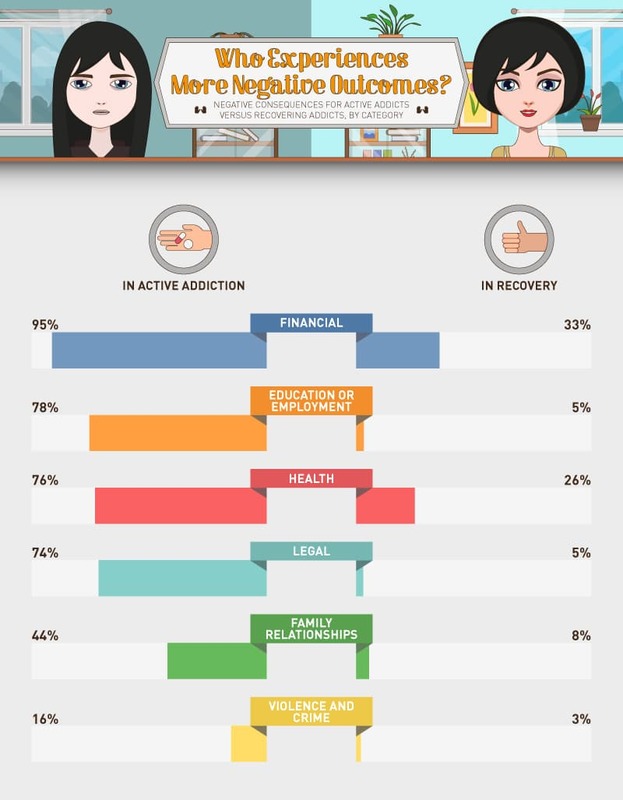 Seventy-eight percent of those in recovery enjoyed positive educational and work-related experiences, such as being steadily employed and furthering their education, while 44 percent in recovery saw an improvement of family relationship experiences, such as participating in familial activities and paying back borrowed money. According to the Mayo Clinic, individuals in active addiction neglect responsibilities such as personal finances, hygiene, and even employment in favor of acquiring drugs. Those who are facing addiction can often be identified by their behaviors including: frequently missing school or work, spending money heavily to maintain their addiction, and disconnecting from family and friends. The Mayo Clinic also identified stealing as a common behavior among those facing addiction. Loved ones may notice that “money is missing … or that items have disappeared, ” indicating that addicts may be stealing or selling property to support their drug use. “People quit believing my excuses as I blew up bridges behind me,” recalled one survey respondent. Entering a treatment program can be a positive step for those facing addiction and instability in so many areas of their lives. Psychosocial help can be integrated into a treatment program to help those recovering redirect their energy toward positive efforts. The improvement they make in their lives can be staggering. Just look at the “Education and Employment” category on the chart: Only about 5 percent of those in recovery reported negative consequences in that area, whereas about 78 percent of those in active addiction suffered turmoil at school or work. 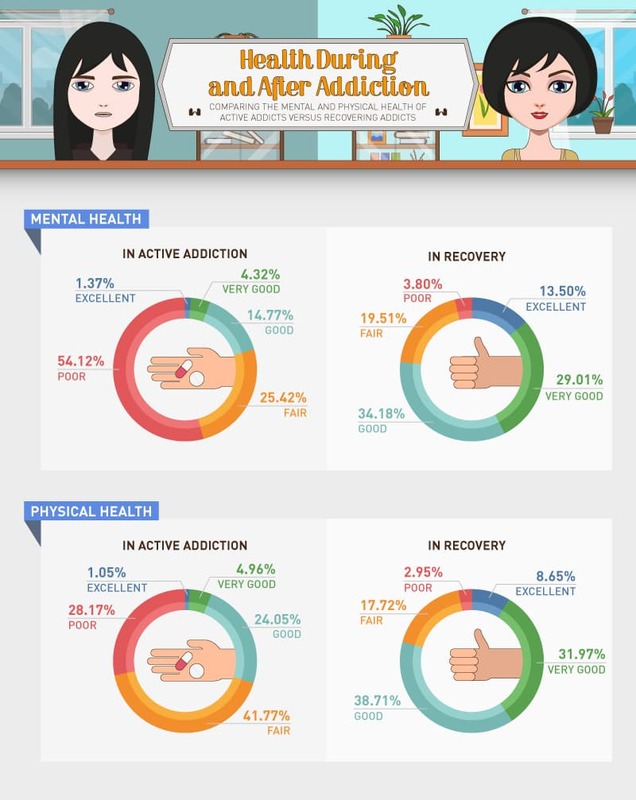 Unsurprisingly, survey respondents in active recovery reported far fewer negative situations than those in active addiction. In some cases, active recovery all but eliminated certain negative consequences, such as the chance of dropping out of school, getting caught driving under the influence, and losing custody of children for issues other than divorce. For those in recovery, negative circumstances – such as lacking health insurance or becoming a victim or perpetrator of domestic violence – also took a turn for the better. People in recovery had an 18 percent improvement in having health insurance, and a more than 12 percent improvement in avoiding domestic abuse scenarios, when compared to those actively addicted. Most notably, people in recovery reported far fewer financial burdens than those in active addiction. Fifty-five percent of respondents in active addiction reported trouble paying bills compared to 14 percent of those in recovery. Overall, those in recovery were more likely to pay their bills, maintain solid credit, and avoid bankruptcy or debt. One of the best upsides of sobriety is saving money, as people discover when they stop putting money toward addiction and instead start building a solid financial future. As for positive experiences, those in recovery appeared to have a better time overall than those in active addiction. With greater freedom of action (and without a consuming habit to support), people in recovery used their increased energy and motivation to undertake more positive actions. These included paying bills on time, participating in family activities, getting a place of their own to live, and voting. Survey responses also emphasize the mental and physical health gains people in recovery realize. Those aiming for complete sobriety were more than three times as likely to exercise regularly, more than four times as likely to eat healthy, and almost three times as likely to further their education. When comparing life in addiction to life in recovery, we observed a stark contrast. A life of addiction tends toward sickness of mind, body, and relationships, while a life in recovery favors hope, health, and success. Before recovery, many of our respondents reported contracting illnesses related to their addictions, damaging relationships with loved ones, and getting into trouble with the law. But recovery provided a path to positive change. Just as we’ve found throughout our study, recovery is the journey back to health. Even if it takes several months or even years, the benefits of a sober life are worth the effort. If you or your loved ones are working toward recovery from drug and/or alcohol addiction, you’ll want to start by choosing the right programs and services. We can help. At Recovery.org, we have access to thousands of treatment providers, detox centers, and rehab facilities – and we’re ready to help you find one that matches your needs. We surveyed 1,039 people in recovery from drug and/or alcohol addiction. We asked respondents about the experiences they had while in active addiction and recovery.